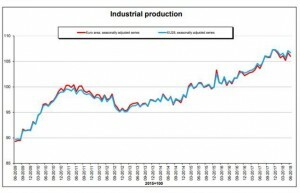 According to the latest report published by Eurostat, the statistical office of the European Union, “In June 2018, compared with May 2018, industrial production fell by 0.7% in the euro area (EA19) and by 0.4% in the EU28.” However, in June 2018 industrial production increased by 1.4% in the euro area and by 1.3% in the EU28. Additionally, the report mentioned that in May 2018, compared with May 2017, industrial production increased by 2.4% in both the euro area and EU28. The 2.5% increase in industrial production in the euro area in June 2018, compared with June 2017, is due to rises of 4.3% in the production of capital goods, 2.8% for non-durable consumer goods, intermediate goods by 1.8% and durable consumer goods by 0.9% . On the contrary, energy production fell by 2.8%. “In the EU28, the 2.6% price increase is due to rises of 4.4%, 3.1%, 2.2% and 2.1% increase in the production of capital goods, non-durable consumer goods, durable consumer goods and intermediate goods, respectively.” However, there was a fell in the production of energy by 2%. Notably, the largest increases in industrial production were observed in the Ireland (+7.7%), Romania (+7.0%), the Czech Republic (+6.9%) and Poland (6.7%). On the other hand, decreases were observed in Denmark (-1.2%), Portugal (-1.0%) and the Netherlands (-0.2%).